Regular physical activity (PA) is increasingly promoted for people with rheumatic and musculoskeletal diseases as well as the general population. We evaluated if the public health recommendations for PA are applicable for people with inflammatory arthritis (iA; Rheumatoid Arthritis and Spondyloarthritis) and osteoarthritis (hip/knee OA) in order to develop evidence-based recommendations for advice and guidance on PA in clinical practice. The EULAR standardised operating procedures for the development of recommendations were followed. A task force (TF) (including rheumatologists, other medical specialists and physicians, health professionals, patient-representatives, methodologists) from 16 countries met twice. In the first TF meeting, 13 research questions to support a systematic literature review (SLR) were identified and defined. In the second meeting, the SLR evidence was presented and discussed before the recommendations, research agenda and education agenda were formulated. The TF developed and agreed on four overarching principles and 10 recommendations for PA in people with iA and OA. The mean level of agreement between the TF members ranged between 9.8 and 8.8. Given the evidence for its effectiveness, feasibility and safety, PA is advocated as integral part of standard care throughout the course of these diseases. Finally, the TF agreed on related research and education agendas. Evidence and expert opinion inform these recommendations to provide guidance in the development, conduct and evaluation of PA-interventions and promotion in people with iA and OA. It is advised that these recommendations should be implemented considering individual needs and national health systems. To promote the health benefits of PA in the general population, the WHO5 and American College of Sports Medicine (ACSM)2 have provided internationally accepted recommendations for PA (table 1). In this manuscript, the term PA always includes both physical activity and exercise according to the definitions above. Inflammatory arthritis (iA, in this manuscript encompassing rheumatoid arthritis (RA) and spondyloarthritis (SpA)) and osteoarthritis (OA) (in this manuscript encompassing hip/knee OA (HOA/KOA)) are major causes of pain and disability worldwide.6 There is strong evidence for the benefits of PA on improvements on disease activity,7 activities and participation; however, people with rheumatic and musculoskeletal diseases (RMDs) are in general less active compared with healthy controls.8–10 Possible underlying reasons could be that healthcare providers (HCP, including rheumatology health professionals (eg, physiotherapist (PT), occupational therapist (OT), nurse, podiatrist, psychologist), physical education professions and medical doctors (rheumatologists and other specialists)) and people with iA and OA may be reluctant towards engaging in PA, fearing flare-up or joint damage by exercising.11 Furthermore, current clinical management recommendations such as the European League Against Rheumatism (EULAR) recommendations on the management of RA,12 SpA13 or HOA/KOA14 and the ACSM guidelines for exercise testing and prescription15 recommend exercise and/or PA, but none of these is specific regarding the required type and dosage. Therefore, it is not clear how these recommendations should be used in routine clinical care. In particular, the evidence on the effectiveness and safety of exercise and PA to a level that meets public health (PH) recommendations has not yet been clearly examined and defined in people with RMDs. A EULAR task force (TF) was therefore set up (1) to evaluate if the PH recommendations for PA are applicable for people with iA and OA; (2) to develop evidence-based recommendations on PA-promotion and -delivery in the management of people with iA and OA and (3) formulate an educational and research agenda. These EULAR recommendations for PA in people with iA and OA are for HCPs, patient organisations and policy makers. The EULAR standardised operating procedures for the development of recommendations were followed.16 The AGREE II-instrument17 was used to structure this manuscript. The multidisciplinary TF consisted of a selection of 22 European PA-experts (six medical doctors, including three rheumatologists, one of them specialised in cardiovascular diseases, one GP), one orthopaedic surgeon; nine PTs, a psychologist, an OT, a nurse and a human movement scientist) and three patient representatives. A steering group managed the process (convenor KN, methodologist TVV, expert JB, fellow AR). During the first TF meeting, definitions of exercise and PA were clarified and the TF agreed to follow the ACSM position stand.2 The TF agreed that RA and SpA as predominant iA conditions, and HOA/KOA as most relevant for PA recommendations would represent the field of iA and OA, respectively. Clinically relevant questions on the provision of advice and guidance regarding exercise and PA, from which 13 research questions were defined by consensus to guide the subsequent detailed systematic literature review (SLR) (online supplementary table S1). Two SLRs were performed by AR with the support of two librarians and under the supervision of the convenor and methodologists. The questions were written according to the Population, Intervention, Comparison, Outcome (PICO) format,18 resulting in two PICOs: (1) on effectiveness, safety and feasibility of PA and (2) on facilitators and barriers towards PA (online-supplementary table S2). For the first PICO, the fellow searched for key meta-analyses (MAs) or systematic reviews (SRs) including randomised controlled trials (RCTs) that investigated the effectiveness of PA-interventions in adults with RA/SpA/HOA/KOA. The SLR was performed in PubMed/Medline, Cochrane Library, Embase, Web of Science, Emcare and PsycInfo, using both MeSH terms and freetext, covering the time frame until 4/2017. For the second PICO, a SLR, covering the time frame until 7/2017, was performed in PubMed/Medline and Cochrane Library including qualitative studies if they described facilitators and barriers regarding PA (including exercise) in people with RA/SpA/HOA/KOA. Experts in the field of RA (EH), SpA (HD), OA (CJ) and behaviour change (KK), respectively, checked if all relevant titles and abstracts were included. Based on the PICOs, the same author (AR) screened the titles and abstracts according to inclusion and exclusion criteria. Potentially relevant articles were identified and full text versions evaluated. Studies including adults (>18 years) with RA/SpA/HOA/KOA that included PA interventions that met the PH recommendations according to the ACSM principles2 regarding frequency, intensity and duration for effective interventions were eligible for inclusion. All data extractions were checked by experts from the TF. During the second TF meeting, the results from the SLR were presented, and the experts developed ‘overarching principles’ (background statements to preface recommendations) and drafted 10 recommendations through an iterative process of discussion and consensus. After the meeting, the recommendations were collated and sent to the TF members by email, to rate the level of agreement (LoA) independently and anonymously on a 0–10 point scale (0=totally disagree, 10=totally agree). Mean LoA >8 would be considered a ‘high’ LoA. Furthermore, the TF formulated a research agenda and education agenda based on identified gaps in the evidence. 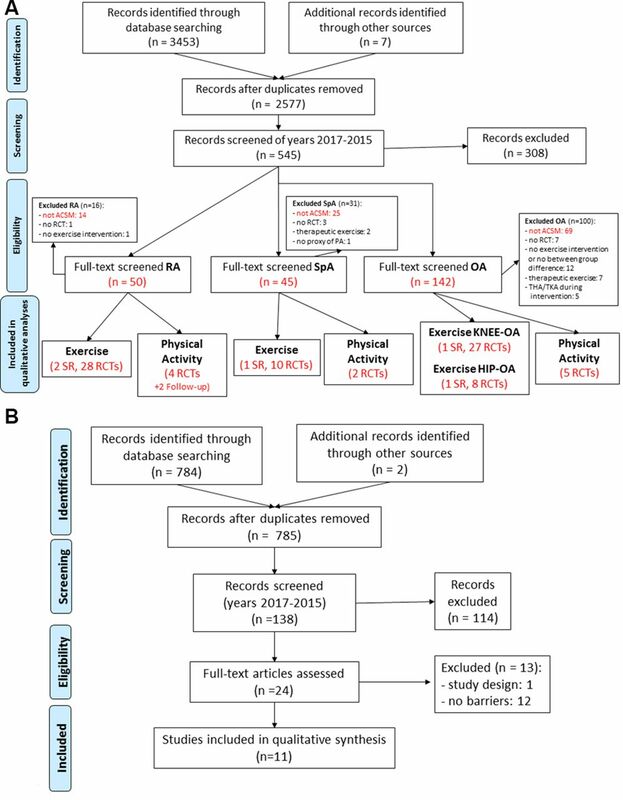 The search yielded 3471 references, 96 of which were included in the SLR: Four MA/SR7 22–24 and 66 RCTs25–93 investigated the effects of exercise interventions, 11 RCTs94–106 investigated the effects of a PA-promotion-intervention, 11 qualitative studies and literature reviews3 11 107–115 described barriers and facilitators regarding PA (figure 1A,B). The included RCTs were published between 1985 and 2017. Most information is from studies with low (48%) or unclear (39%) risk of bias (online-supplementary figure S1). Flowcharts of the literature search related to PICO_1 (A) and PICO_ 2 (B). ACSM, American College of Sports Medicine; OA, osteoarthritis; PA, physical activity; PICO, Population, Intervention, Comparison, Outcome; RA, rheumatoid arthritis; RCT, randomised controlled trial; SpA, spondyloarthritis; SR, systematic review. The TF agreed on four overarching principles and 10 recommendations for PA in people with RA/SpA/HOA/KOA based on SLR and expert opinion. High loA was achieved for 9 out of 10 recommendations and 2 recommendations were graded as strength level A. Table 2 summarises the overarching principles and recommendations with their associated level of evidence, strength of recommendation and LoA. Given the evidence for effectiveness, feasibility and safety, the PH recommendations for PA are applicable, and thus, PA should be an integral part of standard care for people with RA/SpA/HOA/KOA. PA according to PH recommendations2 is effective on PA level, physical fitness as well as disease-specific and general outcomes in people with RA/SpA/HOA/KOA (category l evidence16). Our MA including 16 RCTs26 35 36 42 43 50 54 56 57 61 70 showed that cardiovascular exercises have a moderate beneficial effect on cardiovascular fitness (evaluated in VO2 max) in all three conditions. Our MA including 25 RCTs25 28 31 34 38 39 44 47 49–51 59 62–66 72 75–78 81–83 85 86 88 90 91 showed that muscle strength exercises have a moderate beneficial effect for muscle strength in people with RA and HOA/KOA. Our MA including seven RCTs52 55 58 78 88 90 116 showed that combined exercises (aerobic or strength exercises plus flexibility exercises) had no effect on flexibility in people with SpA or HOA/KOA. However, exercise conditions, assessments and outcome measures varied greatly. There is no study comparing the effect of flexibility exercises alone versus no exercises. In one RCT,48 the effect of a neuromotor-exercise programme on neuromotor performance was investigated in people with RA showing a positive effect. Eleven RCTs described the promotion of daily PA. Our MA including six RCTs95 98 101 102 104 117 applying BCTs for the counselling intervention showed a small beneficial effect. Feasibility of interventions can be captured by adherence to the intervention or the study protocol.118 Adherence to interventions (number of sessions attended/total number of sessions) has been reported in 26 RCTs (35%) and the mean adherence was 69% in people with SpA, 71% in people with RA and 79% in people with HOA/KOA. However, the (self-) reported adherence to intervention might be overestimated due to recall bias or social desirability. In 68 RCTs (94%), protocol violations were reported, with approximately 10% of these being disease-related or intervention-related. PH recommendations for PA can be considered safe. No detrimental effects were reported, rather beneficial effects on disease activity and symptoms in iA.7 Forty-four per cent of all included RCTs reported on adverse events (AE), of those 62% described no AE and 38% describe minor AE such as transitional exercise related joint or muscle pain. All HCPs should have a responsibility for PA promotion and collaborative working that facilitate a close cooperation between different professions to support appropriate disease management. This statement was based on the finding that 66% of the included studies reported the profession of the HCP providing the intervention, of which 75% were PTs.25 31 36 40 44 45 48 50 53 55 58 61 64–66 70 73–79 81 84 87 88 91 94 96 101–105 119 120 However, the functions and responsibilities of HCPs vary across Europe.121 122 Therefore, the TF agreed that PA advice should be provided by all HCPs. Tools for specific contraindications (CIs) were found;15 94 124 however, available general or national guidelines defining absolute or relative CIs should be followed as a priority. The PA-interventions should be based on individual aims, which should be regularly evaluated. This can be done by PA assessments and any other assessments related to the individual aims. As PA assessments, performance–based tests, patient-reported outcome measures (eg, SQUASH,104 PASE94) and self-monitoring tools (eg, wearables such as Fitbit,100 pedometer99 or accelerometer101) were identified. However, we did not evaluate the validity and reliability of the assessments applied. General and disease-specific barriers (that are not CI per se) and facilitators should be addressed as described in 11 studies.11 107–115 125 Disease-specific barriers included lack of knowledge about the disease, lack of knowledge about safe exercising (both in people with iA/OA and HCPs) and symptoms like pain, fatigue, stiffness, reduced mobility, fear of flare-ups or causing damage. Disease-specific facilitators included positive impact of exercise in symptoms or disease control, information about disease and correct exercising, the use medication for pain prior to exercising, using self-regulation techniques, supportive, but not controlling encouragement from HCPs and a supportive social background. Adaptations to PA should be made on a comprehensive individual assessment. However, no evidence on the necessity of general adaptations in people with RA/SpA/HOA/KOA was found. In some RA studies the ‘24 hour-rule’ was applied, that is, the exercise intensity was reduced when the increased pain persisted for more than 24 hours.23 40 50 ACSM provides adaptations to exercise testing in people with arthritis (eg, no high-intensity testing if acute inflammation) and training such as exercising when pain is typically least severe or to train carefully in order to reduce risk of associated injuries, although no clear evidence that high-impact activities cannot be engaged during active inflammation.15, pp. 298–301 Individual disease-related barriers (eg, symptoms) may determine these adaptations. BCTs should be an integral component of PA-interventions. Several behaviour change theories were used in PA promotion interventions in the field of RA and HOA/KOA,4 126 but the reporting was poor. Future research based on theories in design, evaluation and interpretation of findings is needed. HCPs should consider the whole range of modes to deliver interventions. No evidence on the superiority of specific delivery modes was found. The delivery modes of PA-interventions vary considerably and are mostly described as ‘land-based and/or water-based’ and ‘supervised and individualised’, the latter usually applied to group settings. As booster strategies phone calls,36 96 98 105 devices (eg, pedometer,98 99 wearable100 101), home visits,63 70 log book,36 51 76 98 web-based instructions,127 written material,51 54 103 visual instructions (eg, video103) were reported. Based on the gaps identified in the literature, the TF discussed and proposed a research agenda (box 1) with the prioritised research topics and an education agenda (box 2) with topics for education and training in PA promotion for HCPs. Evidence on impact of (reducing) sedentary behaviour emerged as an important future research topic. To evaluate the long-term effectiveness of PA at different intensities and types and monitoring of adverse events (AE). To evaluate links between PA behaviour and disease-specific outcomes. To evaluate the long-term effectiveness of sedentary behaviour reduction, including the monitoring of AE. To evaluate links between sedentary behaviour and disease-specific outcomes. To identify which PA-intervention strategies work best to increase PA level and adherence in various subgroups. To identify markers of response and non-response to PA treatment. To identify disease-specific contraindications on different exercise domains (cardiovascular, strength, flexibility, neuromotor). To further develop and evaluate strategies to reduce and monitor a change in sedentary behaviour. To develop PA-interventions targeting all exercise dimensions simultaneously with special focus on feasibility. To evaluate and recommend valid PA assessments feasible for the use in clinical practice. To study how to facilitate PA behaviour change immediately from screening onwards and how to address facilitators and barriers. To identify facilitators and barriers of healthcare providers towards applying the PA recommendations. To perform long-term effectiveness trials on combined interventions including other health behaviours. Increase knowledge about PA among health professionals (HPs), physicians and people with inflammatory arthritis and osteoarthritis. Increase HPs’ and physicians’ skills in communicating the role of PA in managing general health and disease-specific issues. Include knowledge and skills on PA promotion in all HPs’ and physicians’ undergraduate training curricula. Develop a EULAR training module on PA for HPs and rheumatologists. Propose a session on PA at every EULAR congress. Develop education materials for people with inflammatory arthritis and osteoarthritis. The TF agreed on 4 overarching principles and 10 recommendations for PA in people with RA/SpA/HOA/KOA, which integrated the perspectives of the TF members from different professional, cultural and personal backgrounds. This led to a broad consensus on the principles and recommendations within the group and ought to foster its feasibility and practicability in the diverging health systems across Europe. The LoA on the recommendations among the TF members was very high. The only exception was about the competency of HCP, which may be due to country specific differences in the availability of HCP competent in PA promotion. Although the PH recommendations for PA are well established, the feasibility and applicability of these for people with iA and OA has not been assessed so far. Accordingly, the development of the recommendations was needed. Expectedly, they emphasise the importance of PA and will guide future PA-interventions in people with chronic rheumatic conditions. We decided a priori to include only studies fulfilling the PH recommendations for PA according to ACSM principles.2 This was a far-reaching decision, which allowed drawing stronger conclusions on the effectiveness and especially the safety of correctly dosed PA-interventions. We followed a pragmatic search strategy with the plan to answer all RQs related to PICO 1 with findings of available SR/MA. However, there were no SR/MA on all exercise dimensions and all conditions available; this led to extracting single RCTs from high-quality SR/MA. This, however, excluded high-quality reviews (eg, Cochrane reviews) and RCTs that did not fulfil the ACSM principles and affected the potential to report 1A evidence according to Oxford levels of evidence.21 Furthermore, only one reviewer screened the abstracts and decided on unclear abstracts together with a second reviewer, which is not fully in line with standard procedures of a SLR.129 However, we applied a double-check by experts to ensure that no relevant studies were missed. A major problem for data extraction and interpretation was that the reporting of interventions in most studies was incomplete. Manuscripts that applied TIDieR130 (Template for Intervention Description and Replication) guidelines reported more precisely the PA-interventions and substantially improved the objective evaluation of the PA-interventions. For the research questions related to the effectiveness and safety of PA-interventions and BCT, the PICO scheme was applied, resulting in 1A level of evidence. All other research questions we had to answer in a descriptive way limiting the level of evidence to 3 to 4. However, this limitation is due to the nature of the research questions. Nevertheless, the qualitative studies may provide valuable insight into important PA-related fields, such as assessments, barriers and facilitators, PA promotion strategies. The recommendations focused on the conditions RA/SpA/HOA/KOA, the most prevalent RMD conditions to increase the generalisability and applicability of the recommendations. However, large heterogeneity between these conditions may limit the precision of the recommendations. Therefore, additional disease-specific recommendations are desirable. In addition, not all subconditions were considered and represented (eg, juvenile arthritis). The research agenda highlights several areas where scientific evidence is lacking. It is a clear ambition to implement these recommendations into daily clinical routine. Due to the different health systems across Europe, development and evaluation of target group and culture-specific implementation strategies are needed and should involve all stakeholders. We thank the librarians Mrs José Plevier and Mr Jan W Schoones, Walaeus Library, Leiden University Medical Center, the Netherlands, for supporting our literature search, and Christian Horvath, Zurich University of Applied Sciences, Switzerland, MSc student for his help in the Cochrane risk of bias assessment.
. American College of Sports Medicine position stand. Quantity and quality of exercise for developing and maintaining cardiorespiratory, musculoskeletal, and neuromotor fitness in apparently healthy adults: guidance for prescribing exercise. Medicine and science in sports and exercise 2011;43:1334–59. Organization WH. Global recommendations on physical activity for health. Geneve: Organization WH, 2010. American College of Sports M. Guidelines for exercise testing and prescription, 2017. Health P. PICO Framework Secondary PICO Framework. 2017.
. Effects of exercise and physical activity promotion: meta-analysis informing the 2018 EULAR recommendations for physical activity in people with rheumatoid arthritis spondyloarthritis and hip/knee osteoarthritis. under revision, RMD open, 2018.
. Cochrane Handbook for Systematic Reviews of Interventions. Version 5.1.0, 2011. Group OLoEW. The Oxford Levels of Evidence 2. Oxford Centre for Evidence-Based Medicine 2011.
. The effect of exercise on sleep and fatigue in rheumatoid arthritis: A randomised controlled study. Irish Journal of Medical Science 2014;1:S110–S11.
. Efficacy of low load resistive muscle training in patients with rheumatoid arthritis functional class II and III. The Journal of rheumatology 1997;24:1531–9.
. Therapeutic benefits of aquaerobics for individuals with rheumatoid arthritis. Physiotherapy Canada 1998;50:40–6.
. Comparable effect of partly supervised and self-administered exercise programme in early rheumatoid arthritis-a randomised, controlled trial. Danish medical journal 2015;62:A5127.
. Effects of aerobic exercise on hematologic indices of women with rheumatoid arthritis: A randomized clinical trial. Journal of research in medical sciences: the official journal of Isfahan University of Medical Sciences 2016;21:9.
. Effectiveness of Aquatic Exercises in Women With Rheumatoid Arthritis: A Randomized, Controlled, 16-Week Intervention-The HydRA Trial. American journal of physical medicine & rehabilitation 2017;96:167–75.
. A randomized controlled trial to evaluate the effectiveness of an exercise program in women with rheumatoid arthritis taking low dose prednisone. The Journal of rheumatology 2000;27:1674–80.
. Six-month home-based exercise and supervised training in patients with ankylosing spondylitis. International Journal of Clinical and Experimental Medicine 2016;9:6635–41.
. Effects of a multimodal exercise program for people with ankylosing spondylitis. Physical Therapy 2006;86:924–35.
. Are swimming or aerobic exercise better than conventional exercise in ankylosing spondylitis patients? A randomized controlled study. European journal of physical and rehabilitation medicine 2009;45:449–57.
. The efficacy of home based progressive strength training in older adults with knee osteoarthritis: A randomized controlled trial. Journal of Rheumatology 2001;28:1655–65.
. The effect of two exercise programs on various functional outcome measures in patients with osteoarthritis of the knee: A randomized controlled clinical trial. Isokinetics and Exercise Science 2010;18:201–9.
. A Community-Based Physical Activity Counselling Program for People With Knee Osteoarthritis: Feasibility and Preliminary Efficacy of the Track-OA Study. JMIR Mhealth Uhealth 2017;5:e86.
. Outcome of an education and home-based exercise programme for patients with ankylosing spondylitis: a nationwide randomized study. Clinical and experimental rheumatology 2013;31:739–48.
. Physical therapy in grassroot military medical units of PLA: current situation. Academic Journal of Second Military Medical University 2015;36:65–8.
. High-Intensity Interval Training Cycling Feasible and Safe for Patients With Knee Osteoarthritis? : Study Protocol for a Randomized Pilot Study. Orthopaedic Journal of Sports Medicine 2017;5. NICE. Behaviour change: individual approaches. Secondary Behaviour change: individual approaches, 2014.
. Cochrane Handbook for systematic reviews of interventions. Secondary 2011. A-KRO and KN contributed equally. Contributors AR and KN contributed equally. AR was the research fellow for the project, undertaking the SLR. The fellow was supervised by the steering group consisting of KN (convenor), TPMVV (methodologist), JB (expert). KN and TPMVV supervised the process of the SLR. KN organised and chaired the TF meetings. AR and KN drafted the manuscript with advice from TPMVV and JB. All authors have contributed to the recommendations by participating in the TF meetings; during discussion and agreement on the recommendations; revising and approving the manuscript for publication. Funding The TF would like to thank EULAR for financial support of this work.